Proper Sitting Posture: Should we really sit for 8 hours? Of course we shouldn't! If you must, at least use proper sitting posture. The first thing to understand about sitting, is that it shouldn't be static. In other words, no matter how wonderful your chair is, or what perfect sitting posture you have, being in that position for long periods of time without breaks is detrimental to your health and your muscles. We are not built to sit still! With that understanding, I want to discuss various ways that you can sit to have proper sitting posture. Chairs are not very good for us in general. Some would argue that they set us up to have back pain and breathing problems. How do chairs do this? They generally promote a slouched posture which weakens postural muscles, puts a lot of pressure on the discs in the low back. Slouching also encourages excessive curve in the mid back, collapses the chest making it impossible to breath properly. It even effects the neck by pushing the head forward, straining neck muscles and setting you up for headaches. 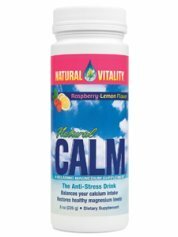 With this in mind, I want to give you several different options for proper sitting posture that you can switch between to reduce strain as much as possible, and reduce slouching. This information is based on the Alexander Technique and Dr. Janet Travell's work on trigger points. B. Forward Head Posture - This posture also creates flattening of the lumbar spine and excessive upper back curve. However, it is the neck the suffers the most. Notice how her head is not supported by her neck, setting her up for headaches and neck pain. She has to really extend the top of her neck so she is not looking at the floor. C. Sitting at Attention - At first glance, this appears to be good posture, but just as with standing at attention, this cannot be maintained for long periods of time. It is simply too demanding. 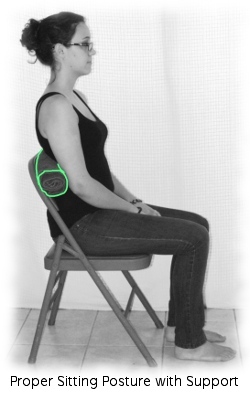 She is not centered over her sit bones (see image below). She is holding her shoulders back, jamming the joints in her upper back. 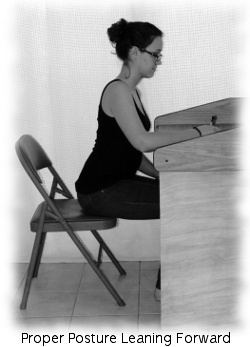 The excess muscle tension is not only very tiring, it also flattens the curves in her spine. D. Proper Sitting Posture - Notice that she is well lined up and relaxed. 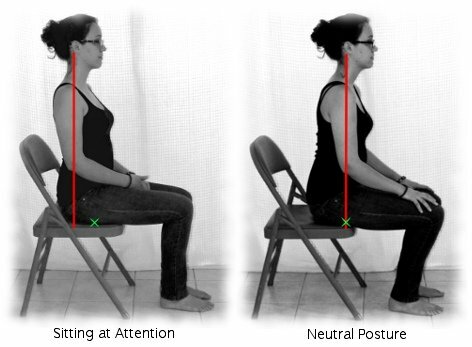 Her head is balanced over her sit bones (see the image below). Her shoulders are not rolled in, her spine has all the proper curves, and her pelvis is neutral. Her chest is open to allow freedom to breathe. This is a posture that can be maintained for longer periods of time. To be able to have proper sitting posture without back support, it is really important that your be sitting on your "sit bones." This is a bit harder than you would suspect. Your sit bones are located near the crease between your buttock and the back of your thigh (marked with a green x in the image above). Notice that when she sits a attention, she is actually not centered over her sit bones, which makes her work harder. This position can also cause pain in her tailbone (coccyx) because she is sitting on it and pressing it forward. You are probably still leaning too far back, creating lots of work for your back and abdominal muscles. (See the image "Sitting at attention" above). Now slowly rock forward on your sit bones - can you let some of those back and abdominal muscles relax now? Put your hand on your low back muscles and feel their tension. Now slowly lean too far forward until you feel them tightening up. Slowly come back toward neutral and see when you can let them go. It will happen when you are centered over your sit bones. Now try leaning back and slowly returning to that same position. You should be able to feel when the low back muscle and your abdominal muscles can let go. Your ideal position will be in between those two extremes. Are you sitting much of the day in your office chair? Posture, as well as the support of the chair is really important since you are there for so many hours. Of course, you will need to be on a level surface — watch out for sitting on a wallet or on worn out cushions in the car or couch. Move your buttocks to the back of the seat. Place a pillow, lumbar support, or a towel rolled up with a 3-4 inch diameter (assuming the chair does not have adequate support in the right location). This should be placed at the level of your belt, about the level of your belly button. Your feet should rest flat on the floor or on a foot rest, and your thighs should not be compressed by the edge of the chair. Allow the chair to support you without slouching - you should be scooted all the way to the back of the chair for this to work. Lean back into the chair and visualize your back lengthening and widening. Release your neck, and allow your head to balance forward and up. Allow your whole spine to lengthen up to your ears. Notice your breathing and allow your ribs and back to expand with your breaths. Allow the lengthening and widening of the torso. Allow your breath to flow freely. When you look down to read or write, allow your eyes to lower but maintain the poise of your head and neck. You should feel light and free. 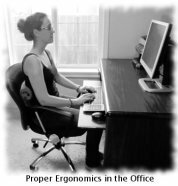 When working, it is important to be able to maintain proper sitting posture while leaning forward. Before you even start leaning, you need to stop and choose not to do it the way you usually do it. Start by finding your "sit bones" as above. You can sit back in the chair or scoot forward as above. Now loosen your hips - think of your legs releasing away from your hips. Your bending needs to happen at the hip joints, so the hips need to be loose. Think of releasing your neck, and allow your head to balance forward and up. Allow your torso to widen and lengthen. Without losing this, lean forward by pivoting forward on your sit bones. You should be bending at the groin, not at the waist. If you are going to be in this position for a long period of time, support yourself with your arm on the desk. There are a few things that are specific to the office. I have a full discussion of office chair posture where I talk about how to modify your chair to fit you, or how to choose a new one. I also discuss how to set up your computer, to minimize injury from poor ergonomics. I also have a page about how to set up your car, to minimize discomfort with driving for long periods. As you work on proper sitting posture, your back will feel tired because you are using new muscles. Taking micro breaks can be really helpful for these muscles. Get up and move around. The Alexander Technique has a semi-supine rest position that can help rest the muscles. It can be helpful to lie down in this position throughout the day for a minute or two at a time to rest the muscles and allow yourself to strengthen them more quickly, as well as increase your productivity. Learn more about how and why to use the semi-supine technique. 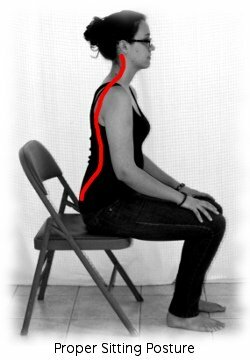 Return from Proper Sitting Posture to MusclePainSolutions Home.